Anthony and Angela, the owners, the hearing-impaired couple behind this newly opened hole-in-the-wall eatery at the corner of the basement in Midpoint Orchard. Angela originated from Vietnam and she has been living in Singapore for 8 years. It is definitely a great challenge for Angela to open this shop. And, why did she decide to embark on it? Angela started to cook since she was 8 years old as her mother told her that she must learn how to cook. She kept on practicing till her cooking skills have improved. She often cooked dishes for friends visiting her house and these friends commented that those dishes are delicious. Their compliments encouraged her and planted a thought in her mind of starting a business. She discussed with Anthony but he asked her to wait first as he needed time to think. Eventually, he agreed and they opened this eatery. Angela is at the shop as early as 9 am to start the preparation process. Their operating hours are long, they operate from 11 am to 9 pm on a daily basis and even so, it is still not as tiring to Angela as she grew up working on the farm, her life was much tougher then. Their friend was there when I went for lunch. I was given an order-chit to go through. 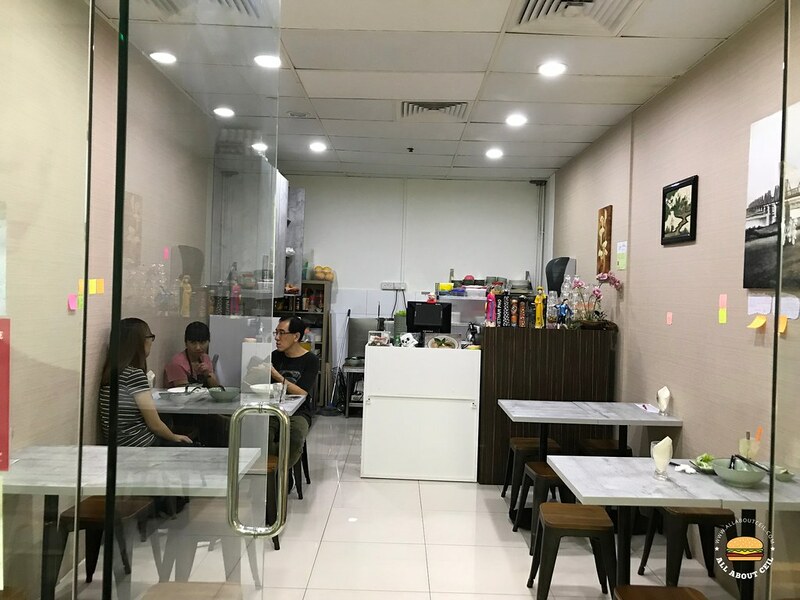 The menu is simple, there is a selection of different types of Pho, Noodle Salad, and Fresh Spring Rolls and beverages like milkshakes, coffee, juices, and soda. I decided to go with Beef Feast Combo ($8.00), Fresh Spring Roll with Prawns, Chicken & Egg (2 pieces for $5) and a canned of coke ($1.50). I brought along the order-chit to the counter and handed it to that friendly lady. 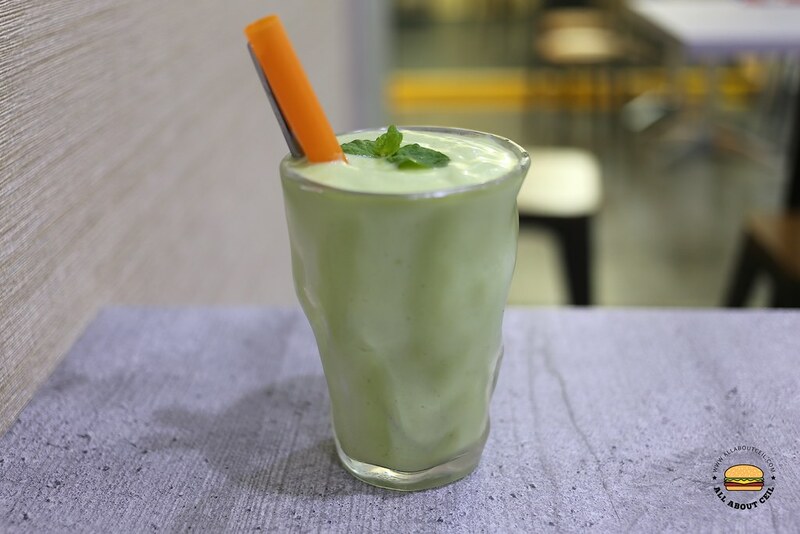 She suggested I should try the Vietnamese smoothie and she recommended Red Dragon Milkshake ($3) but I decided to go with Avocado Milkshake ($4.00). She said, "It is quite different from those out there as no water is added here so the texture is quite thick." Anthony came out to say hello, he waved at me and gave a big smile. There are a few choices for Pho and Beef Feast Combo is the most expensive amongst them. It consists of sliced beef Ribeye, sliced beef shin, and beef balls. The broth was lightly flavored and those slices of beef were cooked well to the right texture. It has a comforting taste. I was asked, "How did you get to know about us?" I said, "A friend told me about it and urged me to go quickly before they become famous." Anthony asked me, through sign language, whether I like the food or not. I do not understand sign language but it was easy enough to guess. I gave him a big thumb up, he smiled and nodded his head. 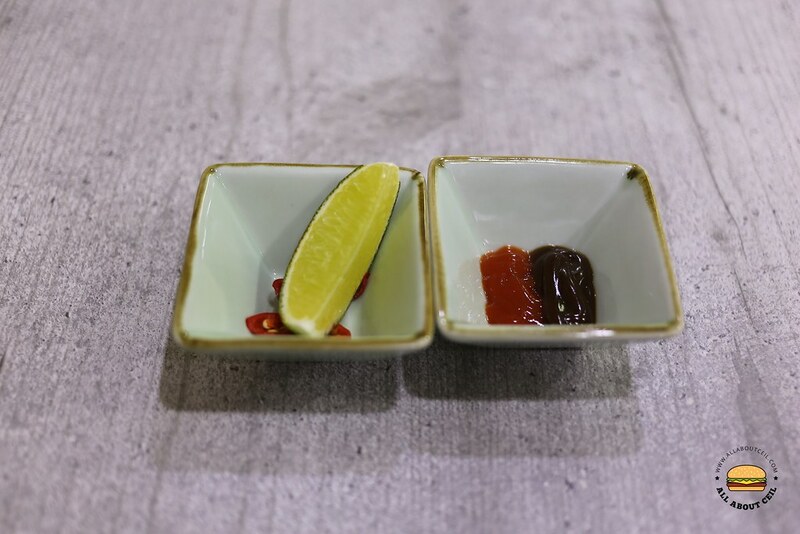 I said, "It tasted good, much better than those that I tasted at those popular Vietnamese eateries." 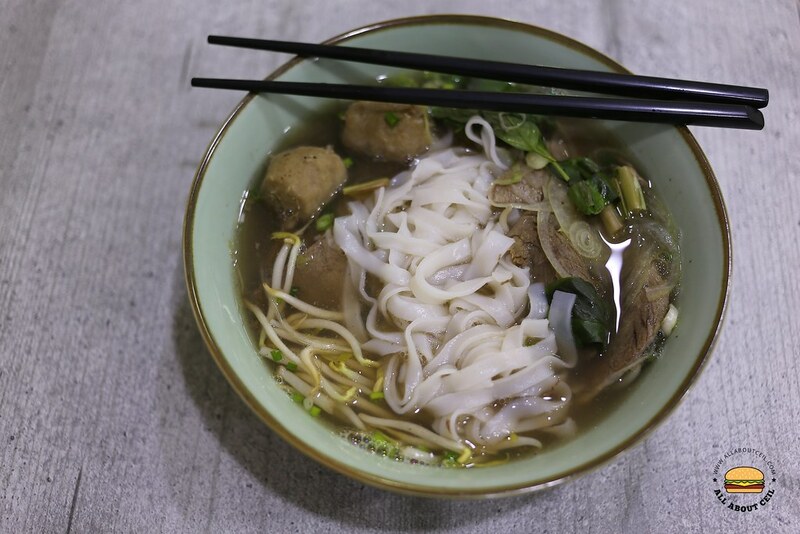 Through their friend that helped to translate, Angela said, "The difference between a good pho and the bad one is the use of MSG and that spoilt the taste. We do not use MSG and oil here." Anthony mentioned that one of their customers came by to try their pho and after tasting it, he liked it so much and he brought along his wife. 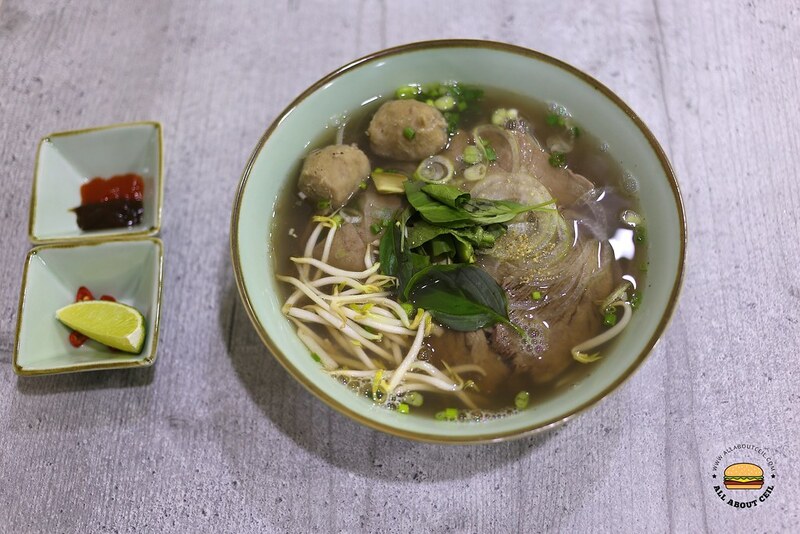 His wife has never really enjoyed eating pho but fallen in love after she tasted their pho. 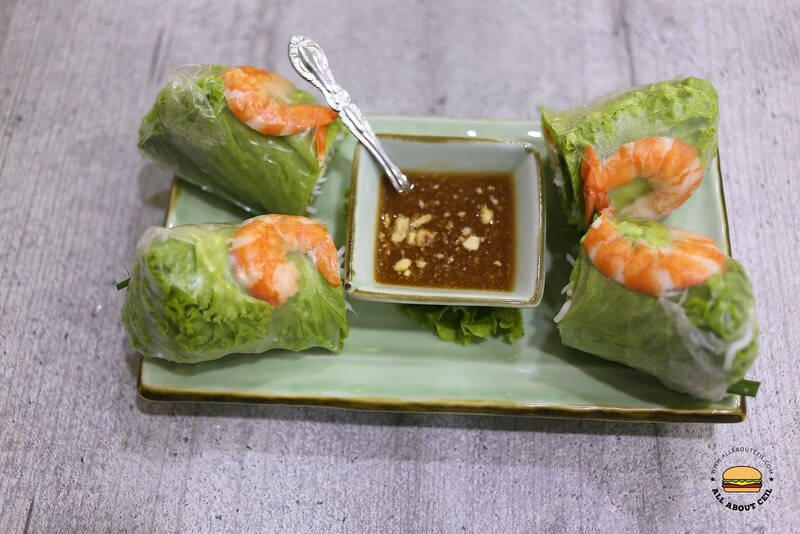 The Vietnamese rolls are freshly made upon order. It has a very clean taste. The roll was packed quite tightly with fresh tasting ingredients like vegetables, vermicelli, chicken, prawn, and egg. Vietnamese dishes are mostly lightly flavored so it is not as fattening as they use mainly vegetables particularly lemon. Through their friend, Anthony asked, "Where are you from?" as he saw me taking pictures of the food earlier. I said, "I keep a food blog." Their friend translated and communicated to him through sign language." Through the friend, he said, "I hope you will tell more people about our shop, get them to come by and try it." I asked, "The rental here is expensive." Anthony nodded his head. I could sense the love that he has for Angela, he is really proud of her and her cooking. 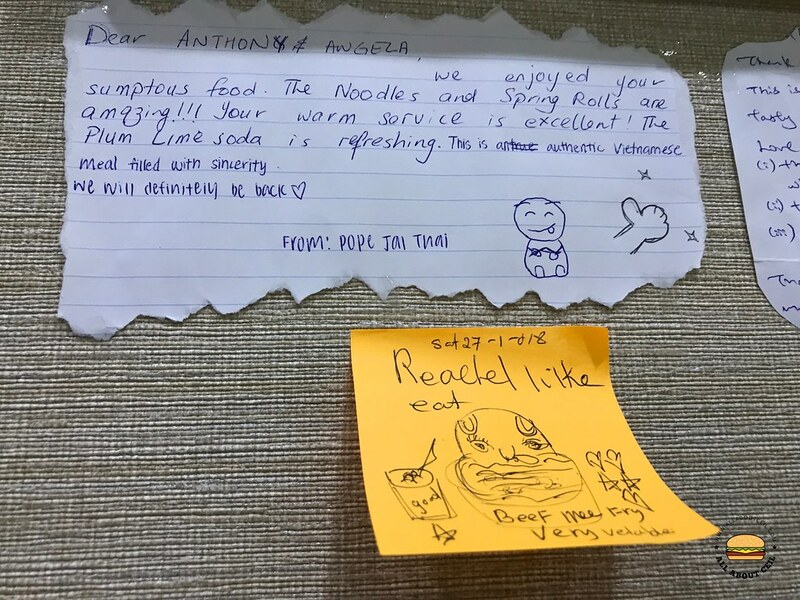 There are many post-it stickers on the wall written by their customers with encouraging messages to Anthony and Angela. 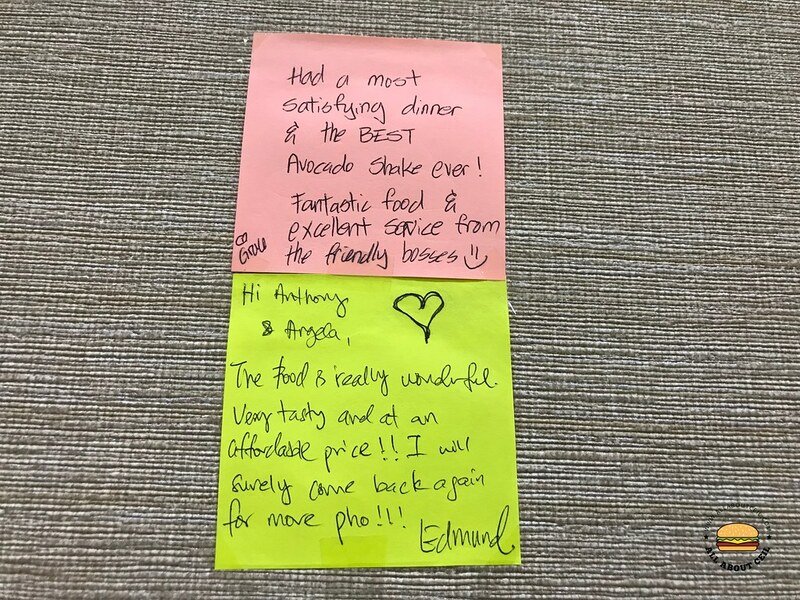 These customers have all fallen in love with the unpretentious homely food and their heart-warming service. They are trying out for 3 months to determine whether they can make it or not. Please go and support them as they deserve a chance to live their dream. I can see the joy on their faces. Happiness can be so simple. Likely to go for the Penang Fried Kway Teow this Friday.